We hope you are enjoying your holidays. Term 1 flew past but we’d just like to mention some exciting things that happened during the first term. Auditions were held in February for NSW Cecchetti Ballet Scholars Program. Four of our beautiful dancers were selected for 2019s program; Olivia Shinfield, Mikaela Hunter, Sarah Glenn & Annalise Macks! This is a unique program, and a wonderful opportunity for the girls to be coached by Nationally and Internationally acclaimed professional dancers and teachers. Well done girls! Earlier this year Thomas Barnett was selected for the Australian Ballet School’s Interstate Training Program, were he receives specialised classes throughout the year with the ABS. Thomas also traveled to Melbourne last weekend to compete in the Cecchetti Young Dancers Awards. We are so proud of his hard work in the lead up to the competition as well as his performance on the day. He did LCDA/RDA and Cecchetti NSW very proud! We held auditions for Main Characters for our end of year concert (already!) Each and every student who auditioned put their best foot forward, stepping out of their comfort zone to demonstrate their ballet, jazz & acting skills. Special mention to the Year 6 students who attended, who held their own amongst our Senior students. You’ve all made it a very hard decision for LCDA & RDA teachers! We’d also like to welcome some new staff to LCDA & RDA; Siobhan Parker teaching Friday Tap at LCDA and Shelley McShane taking Senior Jazz classes at RDA on Wednesday afternoons. We’re looking forward to a very busy Term 2 with the start of competition season, Cecchetti Medal Awards, senior ballet exams & preparation for junior school ballet exams. Please remember the academy does not have pupil free days like the education system. Our first day of Term 2 is Monday 29th April. The end of year performance is the highlight of the year for all our students. To help you plan your Christmas holidays and other festive activities, please add the following dates in your diaries. Rehearsals & photo days are held on the weekends leading up to the concert dates, so please make sure you include all dates. All concert related timetables will be posted on the website. Make sure you are subscribed to the website to receive these alerts. Please note that Performance Group information is also distributed through this subscription. If your child is not a part of a PG you can opt out of Performance Group emails when you subscribe. Saturday 14th December – Two Shows at Shore Theatre for Kindergarten, Year 2, 4, 6 8 & 10+ Students (school years), students perform in both the matinee & evening performances. Sunday 15th December – Two Shows at Shore Theatre for Year 1, 3, 5, 7, 9 & 10+ Students, (school years), students perform in both matinee & evening performances. PERFORMANCE GROUP STUDENTS perform in ALL 6 LCDA & RDA Performances & are required for both full school dress rehearsals at the theatre & the Sunday 24th November rehearsal at LCDA. Sunday 8th December – Two Shows at Shore Theatre, all RDA students perform in both the matinee & evening performances. The Academy has an OPT OUT policy regarding participation in the end of year performance. This means we assume all students will participate in ALL performances for the academy they are enrolled in and a costume deposit of $40 has been applied to each of the classes your child is enrolled for Term 2. The balance for your costume/s will be added to your Term 4 invoice. If your children are NOT available on concert dates or you DO NOT WISH them to participate, the onus is on you to tell us. PLEASE advise by email (lcda@lcda.com.au) before 1st June 2019 if your child will not be involved in the end of year concert. The Costume Deposit charged will be adjusted on your invoice on receipt of the email notice. Payment of the costume deposit secures your place in the concert. What happens if you do not advise us that your child will not be in the concert before 1st June 2019? Costumes require a considerable lead time to ensure they arrive before the concert dates. Most costumes are custom made overseas and unless ordered early, cannot be re-ordered with sufficient time to arrive before the performance dates. If you do not advise the Academy by 1st June 2019, the Academy assumes you will be in the concert and a costume will be ordered. Once ordered, the full cost of the costume will be payable by you. To view your invoice and make payment, please log on to your account via the Family Portal. If you are new to the academy or forgotten how to log in to your account, instructions are found at the end of this newsletter. To avoid a Late Fee please pay by the due date. For those enrolled in Performance Group classes an invoice will be raised which covers additional costs associated with competitions. These costs include the holiday classes attended over the April school holidays, a competition costume and entry fees to competitions. Exam students will be selected at the discretion of the principals to undertake Cecchetti Ballet examinations. BALLET BEGINNERS & BALLET 1 (Pre-Primary & Primary) students must attend 1 ballet lesson per week form the beginning of 2019 to be considered. BALLET 2, 3 & 4 (Grade 1, 2 & 3) students must attend 2 ballet lessons per week from the beginning of 2019 to be considered. Please make sure your child is in the correct uniform. 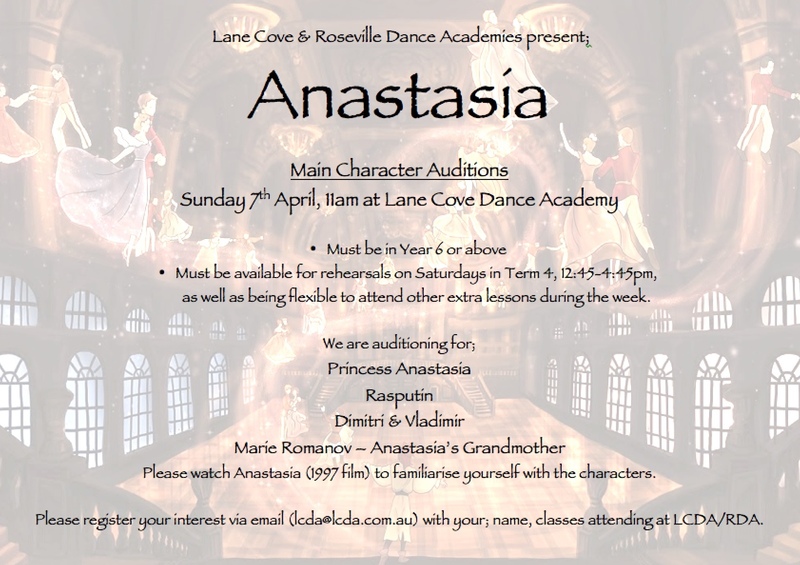 Students who attend Lane Cove Dance Academy must be in correct LCDA Uniform. Details can be found here; www.lcda.com.au/uniforms You can purchase the uniform from Bloch in Westfield, Chatswood. If you tell them at Bloch you are attending Lane Cove Dance Academy they will know what to give you. If you do not already have one, please contact the office for a Bloch Privilege card. Good grooming is essential. All ballet students (Kindergarten age & above) must have their hair in a ballet bun if they wish to participate in class. This is also the preferred hair style for contemporary, jazz, acro & tap. For other dance styles students must have their hair up. Please do not wear jewellery or watches/fitbits into any dance class. Please note that we will be phasing out black jazz skirts. The jazz, contemporary, acrobatics & tap uniform will now include black shorts, black leggings or black jazz pants in winter. Students are welcome to wear their black jazz skirts until they grow out of them. We will then apply it to the invoice and you can pay as normal through the family portal. Please note that Active/Creative Kids Vouchers will not be applied to overdue invoices. Please be reminded that the Academy charges fees by term not by class. Consequently it does not refund for missed classes nor in circumstances when a student decides to discontinue a class. A pro rata system is available in the event a student enrols after the term has commenced. Trial classes are free when a student does not continue after a trial, but is payable and included in fees when enrolment to that class is made. The Academy does not refund for missed classes, family vacations and other personal situations. Make up lessons are available in terms 1 and 2 when the End of Year Performance is not being rehearsed. The Academy does not refund when a student discontinues classes after the first week. If you have any problems regarding your fees, please contact the office by email lcda@lcda.com.au so that we can make appropriate adjustment as required. We hope everyone enjoys the rest of their holidays. Click on the Gold Family Portal button. Enter your email address registered with us as a User Id and your password previously retrieved. If have not previously retrieved a password click on submit to retrieve a password first. When you have the password, go back to the login screen and login with your email address and password. To view your invoice click on My Invoices and the Blue numbers. To pay clink on Pay Here at the bottom of the invoice. Follow the instructions on the screen to complete the payment. Please be careful that the Qty field on the checkout displays 1, any other number will multiply payment. Change the Qty to 1 and remove any old invoices which you have previously paid.